Split the loaf of bread in half, horizontally (as opposed to vertically like cutting a slice). Melt the butter. Using a pastry brush or spoon, brush or drizzle the butter on the open half of the bread. Evenly sprinkle on the chives, garlic, paprika and salt. Put the halves back together making a complete loaf, and place in the oven for about 12-15 minutes until the crust begins to brown. 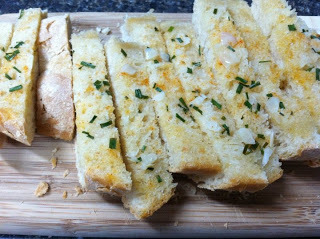 Remove and cut the bread into strips for serving.